A man who embodies innovation recognized throughout his career for his trailblazing approach to music, Becton does not disappoint with his latest single. An up-tempo, cross-cultural, energy charged masterpiece that brings a fresh new sound of Praise to gospel radio while merging familiar “Old School” influences. Over 20 years of experience in the gospel music industry, he continues to influence and shape the gospel music sound with ever changing and thought-provoking works of art. With an instant familiarity within the first two bars of hearing, “Sing Unto The Lord” is a refreshing presence as this song builds into a climatic worship. The industry was first introduced to Pastor Becton when he released the gospel hit-single, “Be Encouraged,” from the CD entitled “Broken.” The song took him from anonymity to notoriety almost overnight. The song debuted on the Billboard gospel charts at #3, and the album propelled to #1 for over 11 weeks. It also hit the Billboard R&B singles chart at #59 for 21 weeks, allowing mainstream listeners to experience music with an underlying Christian message. The “crossover” success of ‘Be Encouraged” set a new trend in gospel music and paved the way for other upcoming gospel artists who also had crossover hits. 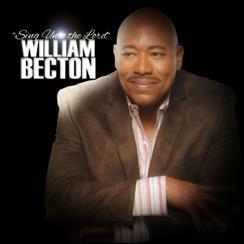 A well-versed scholar, teacher, preacher, pastor, songwriter, and author, William Becton is back and better than ever.